This page breaks down the Manage Letter Configurations page and goes over the different configuration options. 3. In sub menu, click on Manage Letter Configurations. When going to Attendance > Attendance Letters, it automatically ends up on the letter generation page. To manage letter configurations, click on "Manage Letter Configurations." If you don't see this link you may be missing the permission, "Manage Letter Configurations." 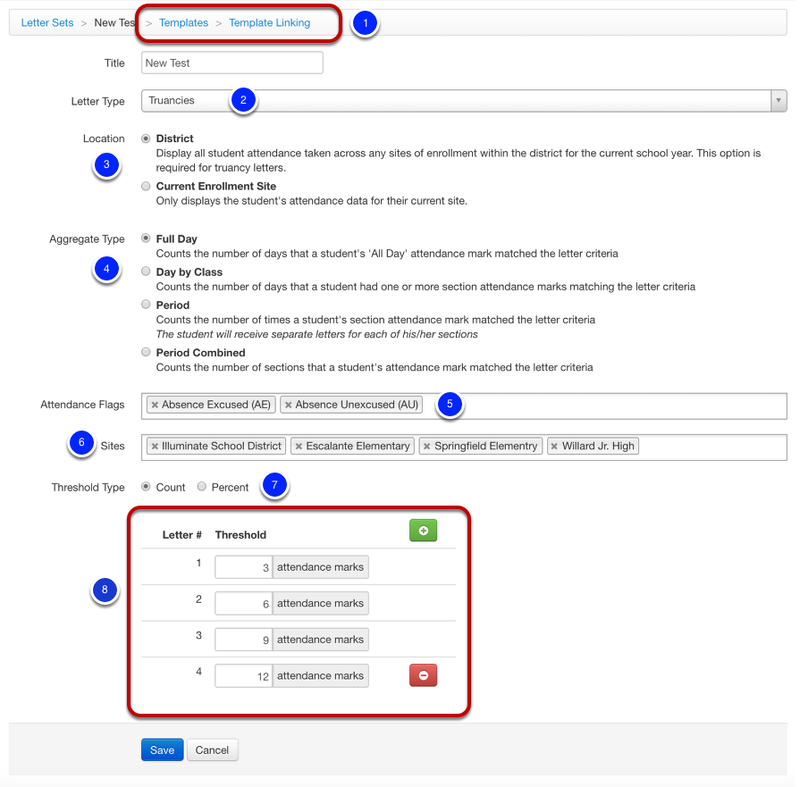 For more detailed information on permissions, refer to the Attendance Letter's article on Functionality and Set-up. Manage Form Letters, also called Attendance Letter Setup, allows users, typically district admins, to set-up their Attendance Letters. Above is the initial screen. Create Configuration: Allows users to create a new configuration. Title: Titles of different Attendance Letter Configurations. Clicking on it brings you the configuration page of an already existing letter set. Aggregate Type: How the configuration counts towards the threshold. The choices are Full Day, Day by Class, Period, and Period Combined. Covered in greater detail below. Threshold Type: How it determines different thresholds for notices. Attendance Flags: Shows the attendance character codes included in the threshold counts. After clicking "Create New Configuration" or on an already existing letter set, it bring you to a page similar to this. 1. Templates and Template Linking: Clicking on "Template" or "Template Linking" brings you to the Template or Template Linking page. For more details on this feature, please refer the help article on Templates and Template Linking. 2. Letter Type: Allows you to select your letter type. 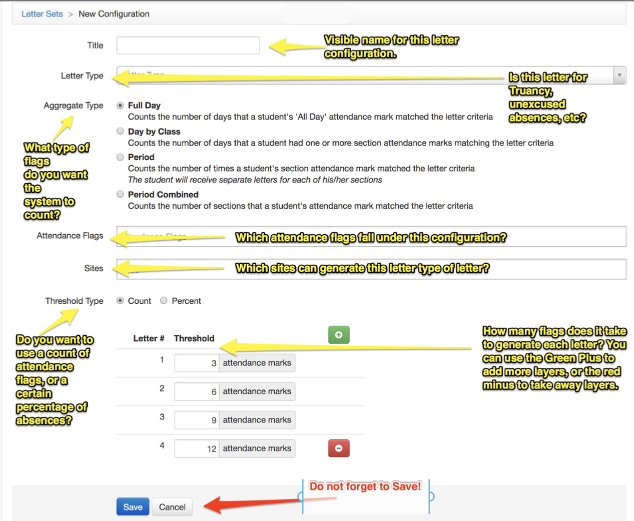 Note, the different options for Letter Type are set up in Code Management in the table called "Attendance Letter Types." District: Display all student attendance taken across any sites of enrollment within the district for the current school year. This option is required for truancy letters. This includes Unenrolled students and will display in the report. A new column will be added called “Currently Enrolled." Current Enrollment Site: Only displays the student’s attendance for their current site. 4. Aggregate Type: Chooses how the threshold counts towards the threshold. The choices are Full Day, Day by Class, Period, and Period Combined. 5. Attendance Flags: Selects which Attendance Flags are counted in the aggregate and threshold. It shows the Attendance Flag long name and the character code in parentheses. 6. Sites: Select all sites using the letter (for travelling attendance letters, also include the district). 7. Threshold Type: Allows you to choose between Count and Percent. Count uses a positive count towards the threshold for each flag a student accrues. Percent calculates the number of flags out of their total flags assigned. 8. Thresholds for Letter Set: Sets the count or percentage for each letter notice. Full Day: Counts the number of days that a student's 'All Day' attendance mark matched the letter criteria. Day by Class: Counts the number of days that a student had one or more section attendance marks matching the letter criteria. Period: Counts the number of times a student's section attendance mark matched the letter criteria. The student will receive separate letter for each of his/her sections. Period Combined: Counts the number of sections that a student's attendance mark matched the liter criteria. Note, this allows you to set thresholds for particular timeblocks/periods.